Looking to capture the thrill of a heated round of Rocket League on your desk? Zag Toys’ collectible pull-back racers won’t do that, but they’re so damn adorable. Announced back in February, Zag Toys’ Rocket League racers are slowly starting to show up at Target and GameStop stores throughout the country. Blind-packaged in spherical plastic containers resembling the big ball that’s always being pushed around in Psyonix’s hit game, the initial batch includes a nice selection of vehicles and some super-shiny variants. Octane in blue and gold. 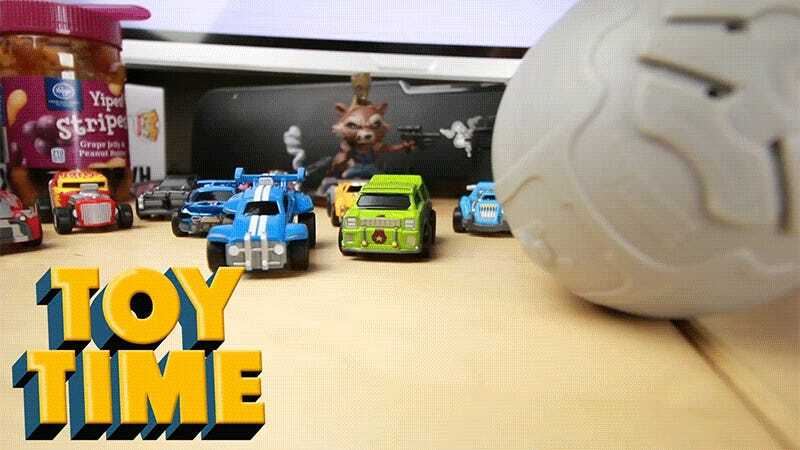 Each toy is around the same size as a Hot Wheels, but don’t expect any die-cast metal here. These are all plastic, with vac-metal paint jobs for the special variants. Light plastic means more play for the car’s pull-back feature, which gives each one the ability to speed towards the ball and knock it into (hopefully) the opposing team’s goal. Octane, Grog, Hotshot, Masamune . . . who else do you see in here? Dedicated fans of the game could theoretically build their own area and play their own tiny Rocket League matches, as long as they don’t mind all the cars only going in straight lines. Or you can just set them all on your desk and pit them against an appropriate goalie. Rocket League pull-back racers from Zag Toys should be popping up at a GameStop or Target near you for around $5.99 a pop.